Dr. Stephen Ervin is as vibrant as his day of birth—Mardi Gras. Like the celebratory day itself, Ervin is animated, larger than life, and full of contagious energy. He has spent two decades working at Harvard University teaching courses, speaking at conferences, and authoring books about his passion—the intersection of computing, design, and science. 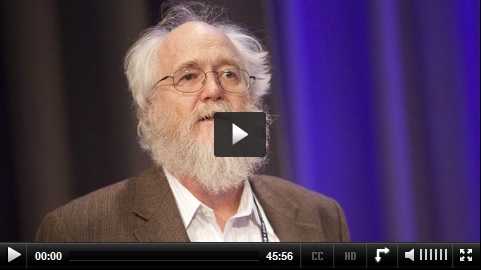 “Geodesign has taken over my life,” Ervin chuckles. The Assistant Dean for Information Technology at Harvard’s Graduate School of Design, Director of Computer Resources, and lecturer in the Department of Landscape Architecture, Ervin still somehow manages to find time to evangelize and promote the principles of geodesign in various ways around the world. 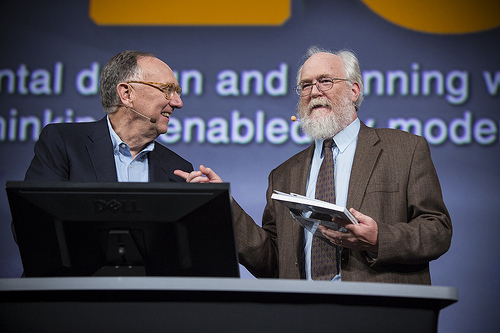 Stephen Ervin (right) accepts the prestigious Lifetime Achievement Award at the 2012 Esri User Conference for his pioneering work integrating GIS and design. The idea that data could be combined with graphical representations was inspirational to Ervin, and shortly after he was introduced to GIS at Harvard University’s Laboratory for Computer Graphics and Spatial Analysis. In 1984, Ervin took this knowledge and began a software company to help landscape architects visualize the results of design decisions. At the 2012 Esri User Conference, Esri president Jack Dangermond presented Ervin with the prestigious Lifetime Achievement Award for his pioneering work in melding together the disciplines of GIS and design. In presenting the award, Dangermond noted that “lifetime” didn’t mean that Ervin’s work was done. There is still much important work to do. Guest post by Karen Richardson.